A brand-new collection of 200 crochet stitches for crocheters of all abilities. 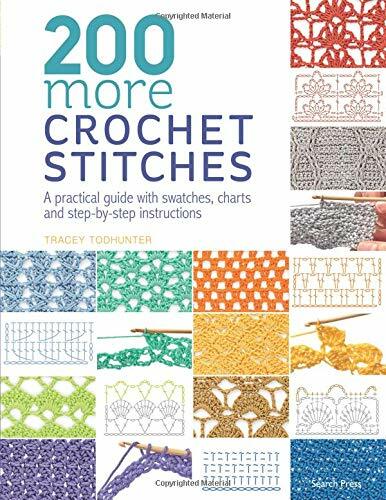 Following the success of 200 Crochet Stitches comes 200 More Crochet Stitches by bestselling designer Tracey Todhunter. This brand-new collection includes both classic and new stitches, reflecting the modern crocheters thirst for new ideas and innovative techniques. As well as popular traditional stitch styles such as ridges, cables, and ripples, there are complex Tunisian stitches, trellis, and picot, plus textured patterns like bobbles and puffs for those who like to add some 3D fun to their designs! This is the only stitch guide to combine clear, photographic step-by-step instructions, charts, and examples of the stitches. The book also includes feature spreads that explore ideas for yarns and colors, along with the multiple ways you can use your newly learned stitches in garments, accessories, and homewares. This is a book packed full of instruction, ideas, and inspiration that crocheters everywhere can dip into time and time again. Amazon UK – £10.54: 30% off; Gift-wrap and free shipping available!